Do you know what yarn-bombing is? I’ve never seen a yarn-bomb “in person” but have viewed many posts about them in my internet travels. Yarn-bombing is the placement of knitted works in surprising urban settings. For example, putting a knitted sweater on a fire hydrant along a busy street. Just introduces a pop of color into an otherwise gray environment. Maybe one would call it knitted graffiti? But somehow I don’t find “yarn-bombing” to be damaging to another’s property. After all if the owner or caretaker of the property doesn’t want it, the yarn-bomb is quite easily removed. Disagree? Personally I would love to come across one of these installations of yarn-art. That brings me to a loosely tied group called “Dispatchwork”. They install Lego art in surprising places. Again it doesn’t seem to be vandalism in my scope, but you might disagree. I think they are smile opportunities. See what you think. At the link I will give at the end of the post, you will come to a world map. Click on the map or the list of cities to be taken to photos and perhaps a short commentary about the “work”. Enjoy and let me know whether you think this sort of thing falls into the vandalism category or is harmless. What’s the connection to quilting you might wonder? The surfaces of the Lego insertion look like little 3D quilts to me-blocks of color, some random, some planned. The name of the group is “quilty” so perhaps the organizers see a connections too. And does everything have to be quilt related anyway? It is mind-boggling to me how in the summer, when days are longer and all that, I seem to have less time for everything? When I say “everything”, I guess I sub-consciously mean quilting, sewing…all that kind of favorite fun, he…he… Does that happen to you? 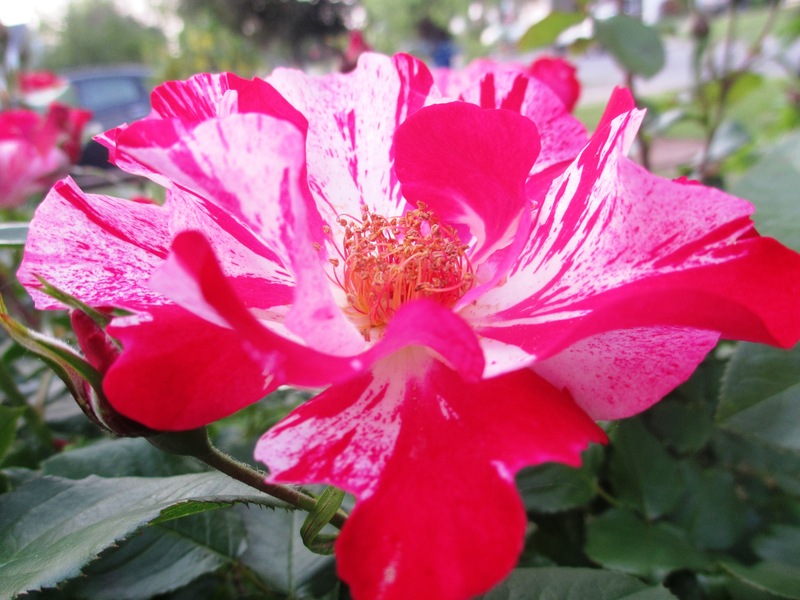 I know we all spend more time outside, tend to our gardens…but still, I always think I should have more time? As I said, mind-boggling. 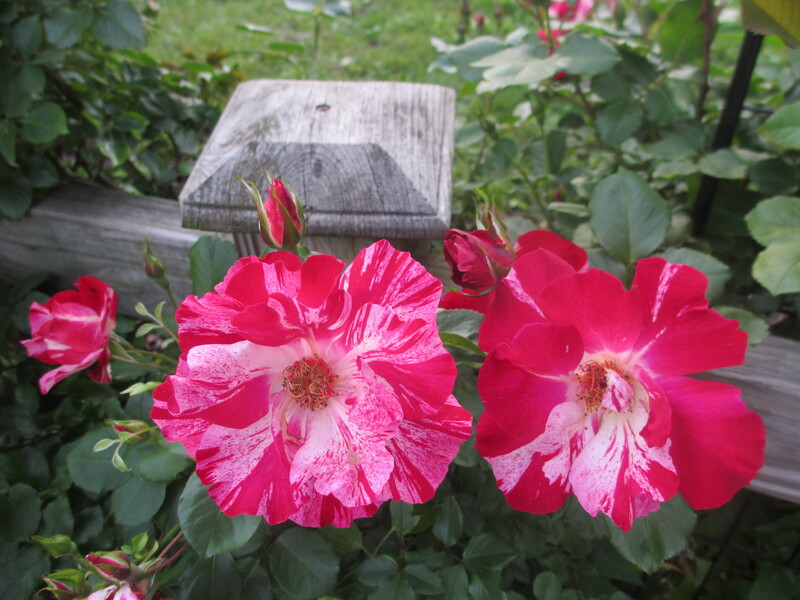 “Forth of July” is one of my favorite rose and I think it will make me do a red and white quilt one of these days – it is just such a riotously happy flower, don’t you think? 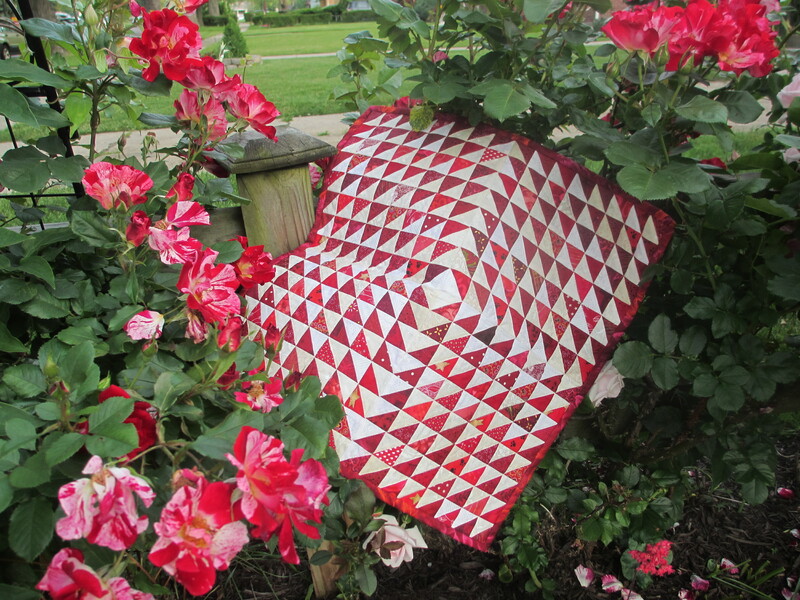 Oh wait, I know someone who already did make a fabulous red and white quilt, and so do you! So how’s that for some color AND Seminar inspiration? Did you choose your classes already? I have to admit that I have conflicts – wish I can be in two classes at the same time! How about you? Can you believe it? I do LOVE the design, just not sure if it would do the job…But here is the link to read some more about it. What do you think – yay or nay? I also found this nice blog with several links for tutorials for small projects to use your scraps and…zippers! For the end, here is a really cute way to make coasters or mug rugs, and of course use your scraps again. The bonus is that if you use different colors for each, they can also serve as glass identifiers, like wine glass rings – another one I will have to try! Well my friends my wait is over (finished work and waiting for husband to finish so we can go home), so I will wrap up here! On to make some dinner and plan tomorrow’s special dinner since our daughter is finally coming home from one of her overseas trips – YAY!! I already have some very interesting recipes on Pinterest I want to try! Do you do Pinterest? How do you use it and like it? Before I retired it would really frost me to start to see “back to school” ads in July. The summer isn’t even half over yet! Now I don’t mind at all because some of my best quilting supplies are bought in the back to school aisles. Probably my number one supply purchased at this time of year-in quantity-is Elmer’s washable school glue. I buy both the glue sticks and the liquid glue. It allows me to avoid pinning in many projects, and actually has increased my accuracy. The most frequent use of the glue is for “basting” my bindings to the back of the quilt before I sew them down by machine. When I first learned to stitch a binding on completely by machine, I was not happy with the way the back would look. Despite my best efforts at pinning or basting in the ditch, the stitching on the back of the quilt was always too far from the fold of the binding and usually was spaced very unevenly from the fold. Now as I am pressing the binding to the back, I glue it exactly where I want it so it just covers the stitching holding the binding to the front and then dry the glue with my iron. Nearly perfect bindings ever time! Second most frequent use of this glue is for invisibly stitching two lengths of border together so the pattern on the fabric flows continuously across the seam. Since most commercial patterns have you cut your borders on the crosswise grain to save fabric, you will have to place a seam in any border longer than 40 inches or so. On a very busy print this is not a problem, but otherwise I find that the border screams “look at me” as the pattern is broken. Those of you who have sewn home dec items such as curtains or slip covers may have learned a technique for hiding the seams so the patterns will flow continuously across long runs of fabric. I have stolen that technique and use it in my borders. It does take more fabric than it would if I didn’t have this pet peeve, but much less than buying enough to cut the borders on the lengthwise grain. Glue basting helps me to get these seams placed perfectly so they are nearly invisible. I won’t go into the technique here, but if you don’t like those broken patterns it’s worth learning. Any book on home dec sewing will have the general explanation in it. And the third common use for me is to help me get a perfect miter when I decide to miter my borders at the corner. I don’t do this often, mostly because the fabric I choose won’t compliment that miter enough to make it worth the effort. I no longer avoid the miters though since the glue makes them easy peasy. I have heard from a few long time quilters that Elmer’s washable school glue is the same stuff that is sold under the name of a big name in quilting for a much higher price. So…start watching for Elmer’s to be the loss leader at one of the big box stores and stock up! 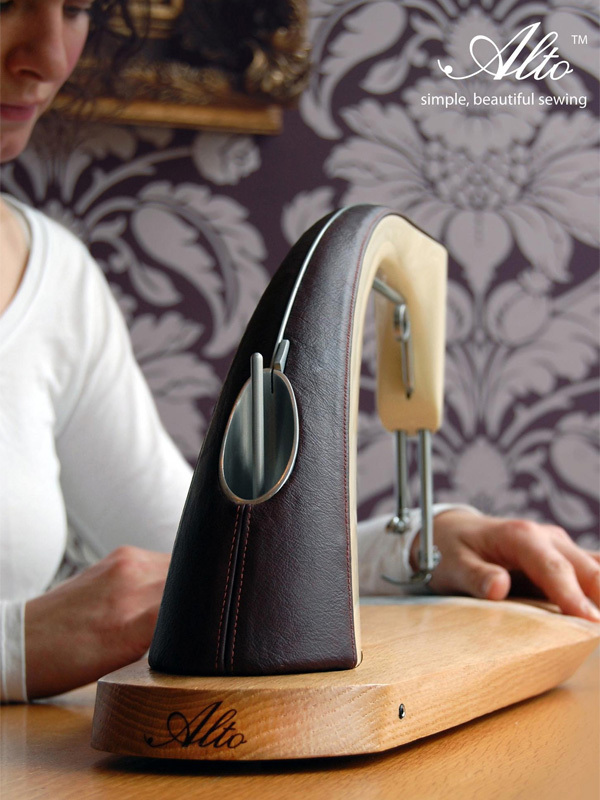 If you have a school supply that you often use in your sewing room, please share the idea with us all. Was trying to catch up on my e-mail and blogs this morning and came across a photo of this recipe at Pat Sloan’s blog (our upcoming seminar teacher). (BTW have you signed up for your class yet? We’ll be mailing supply lists out soon, if you want to get yours the easy way please register this week!) Anyway this recipe really appealed to me. I have loads of fresh basil in the garden waiting for the right recipe, and have been overdosing on fresh spinach in my toss at salad bars. If you made your own bread crumbs from Fiber 1 cereal (click here), this could be a very WW friendly recipe. Have a look at the photo and see if you can resist. click here. The text in the blog entry that goes with it is amusing too. I think the ingredients will definitely be on this week’s grocery list. Are there any other quilters out there like me, who like to eat more than to cook ? Hate to chop stuff up (that’s why I go nuts at a good salad bar) but love to enjoy the finished product. Let me know if you try this recipe out. I’ve been MIA for a while now. Taking care of an elderly mom who has had several strokes. Things are beginning to come around; keep her in your prayers please. This post was in an e-mail this morning; since we’re having a visit from some of our WNY Modern Quilters to an upcoming guild meeting I thought this would be a perfect quick post. Look around at their website while you’re there to get a peek at what some modern quilters are about. Click here. If you’ve ever wondered why the thread tension on your machine is so important and sometimes so finicky, perhaps this animation of the formation of a stitch will clear up some of the confusion. 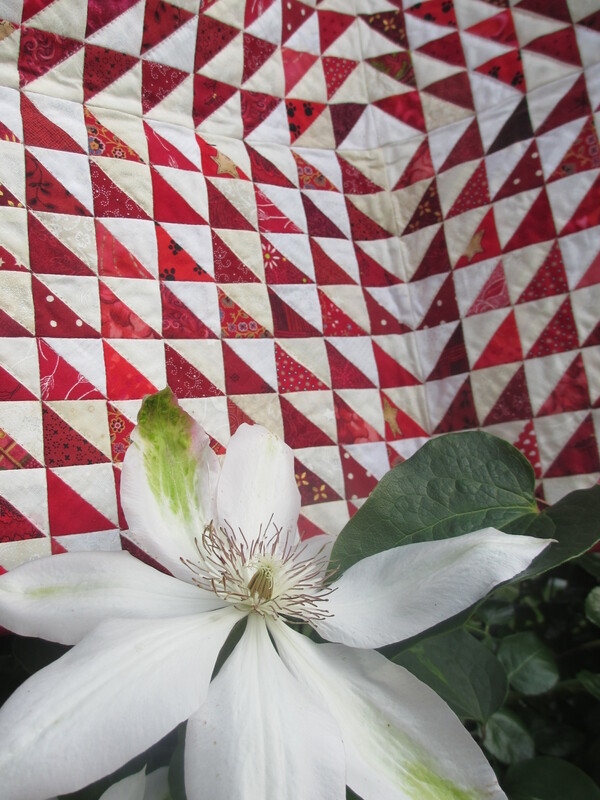 Found a link to this at the selvage blog-great fun for fans of selvage quilts. Have a look here. If you’ve ever wondered how you could put zentangle into your quilts, here’s a nifty tutorial. Great for collectors or black and white fabrics like myself. Even small scraps could be put to use. (click here) I love this idea, and am definitely putting on my list. Spent the whole day in the garden beds yesterday. It’s been a great year actually for growing things. 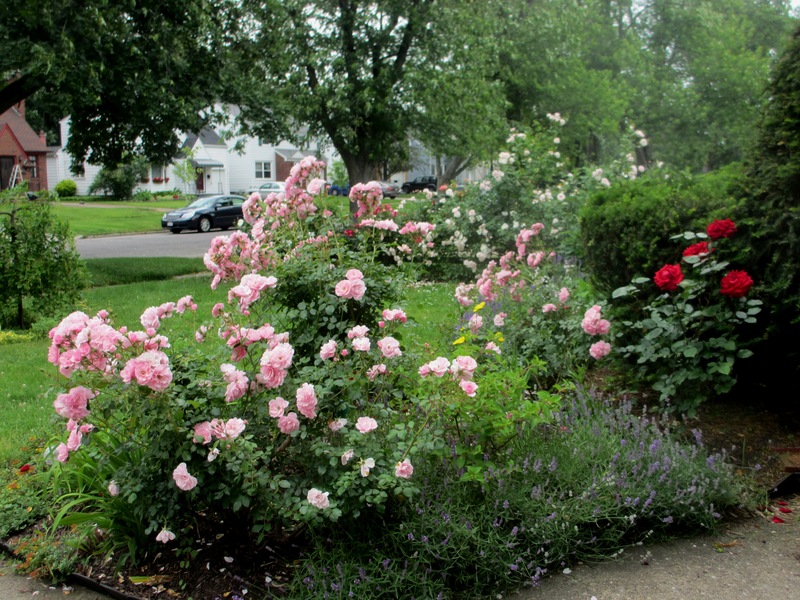 Between the thriving perennials and the overgrown weeds, I had a jungle beginning to take over the back yard. Things are much better now. I should have waited until today-the temperature is so much nicer! I think I’ll tackle a few more beds this evening, off to the sewing machine today. More samples for seminar are in the works. I just came across this discussion at another blog on what our quilts are actually worth. I’m not talking the “sentimental” value. Quilts made and given from the heart are priceless. This discussion was among women selling quilts as an income. Those in the discussion are not the big name “professional” quilters, but are woman like us adding to the family income to pay for groceries, electricity, school clothes, prescriptions, etc. You know what I mean. Even though many were selling at craft shows or other small venues, they were wondering what they should charge for the time, materials and expertise in their items. I will admit that I usually under charge for the quilts/quilted items that I sell. Now that I look over the calculations in the post I will link to at the end, I am REALLY under charging. Granted there is a big difference between what a quilt is worth, and what you can get for it. I am always surprised at how little quilters charge in the boutiques at guild quilt shows. We should be educating the public, even if gently, about what our art and craft is worth. Have a look at this post (click here) and the follow ups to it to see if you agree. Be sure to read the comments that other readers have left. Very interesting discussion. If we don’t place a reasonable value on our work, those purchasing it never will either. Perhaps those of us selling our work at the museum could consider getting together on some pricing guidelines. Perhaps a summary of this woman’s main points would be eye-opening for the browsers in the museum country store. I’d love to hear your opinions about this and perhaps your experiences, particularly if you sell your work.